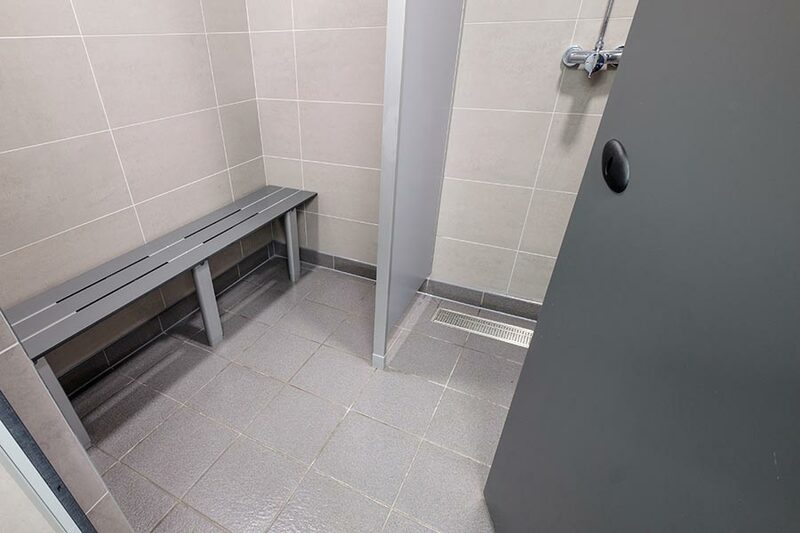 We designed, manufactured and installed a sleek monochrome grey washroom and changing room area for a Chelsea leisure centre. Forte toilet cubicles and Forte shower cubicles – solid grade laminate in grey. Forte changing cubicles – solid grade laminate in grey with Perspex integral roof. Behind the façade of the iconic Grade II Listed Old Chelsea Town Hall just off the King’s Road close to Sloane Square, is Chelsea Sports Centre. The state-of-the-art public gym boasts more than 70 stations, a large fitness area, two fitness studios, a 25m swimming pool and a 10m teaching pool. The centre is one of 258 sport and leisure facilities run by GLL, a not for profit charitable social enterprise committed to delivering a better quality of fitness and leisure, libraries and performing arts facilities for all. 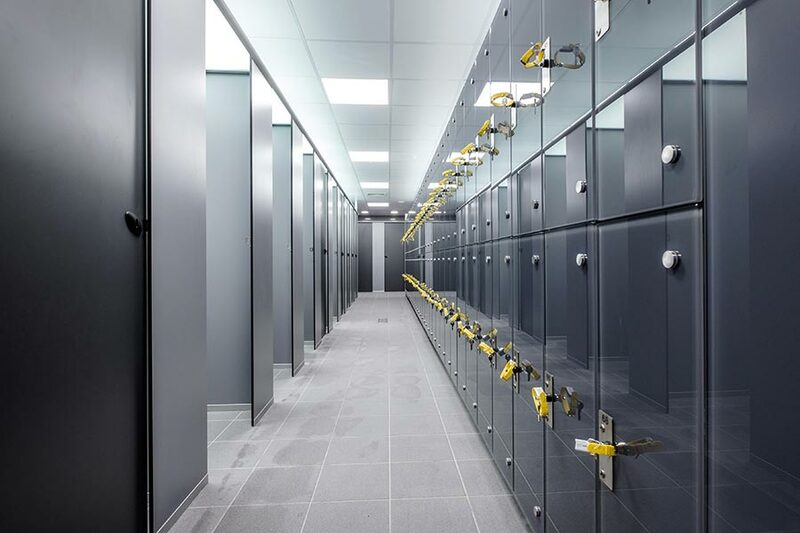 We recently refurbished the shower and changing room areas at Chelsea Sports Centre to refresh the facilities, using a grey colour palette and toughened glass lockers to create a contemporary high specification space, befitting of the modern interior of the rest of the gym. Our flush front glass iLockers, which were fitted with coin return locks and back-painted in a dark grey shade to match the rest of the changing room design, form a key part of the new design. Manufactured with a hardwearing aluminium carcass and radiused back corners for ease of cleaning the iLocker is as hardwearing and durable, making it the perfect choice for a high traffic leisure centre. For the changing cubicles, we installed our Forte cubicles, manufactured from solid grade laminate (SGL) in grey, complete with unique Perspex integral roof to let in light while providing complete privacy for users. As well as being durable and easy to clean, SGL is also resistant to graffiti and impervious to water. The cubicles also feature integrated SGL bench seating and hook rails in the same shade of grey and are finished with ‘D’ shaped satin anodised aluminium headrails. 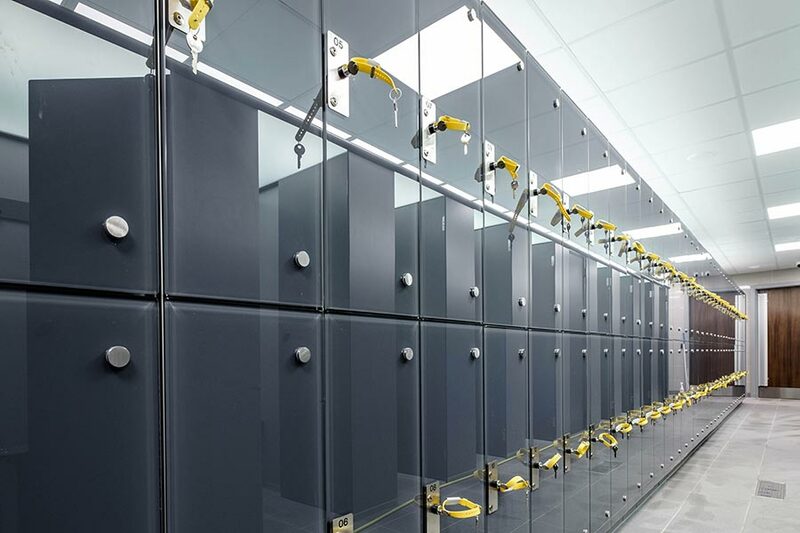 For consistency of design, we installed our Forte shower cubicles in the same grey SGL. We designed and manufactured bespoke Corian vanity units and make-up shelves, both finished in ‘Black Quartz’. The changing room area was completed with our Legato benching, which comprises an aluminium support construction and profiled seating, again manufactured in the same grey SGL. 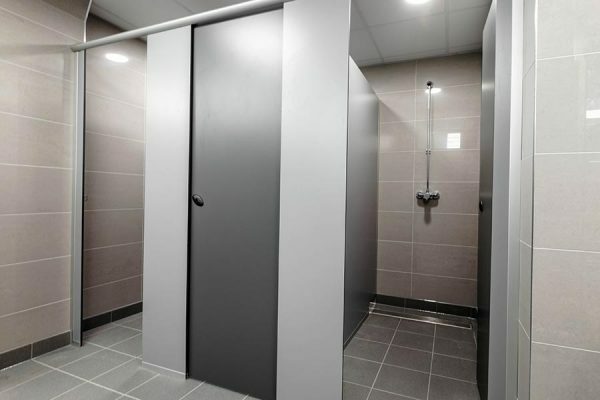 The new washrooms which we installed at Chelsea Sports Centre as part of the refurbishment feature our Forte toilet cubicles and Concerto integrated duct panels both finished in the same cool grey shade.